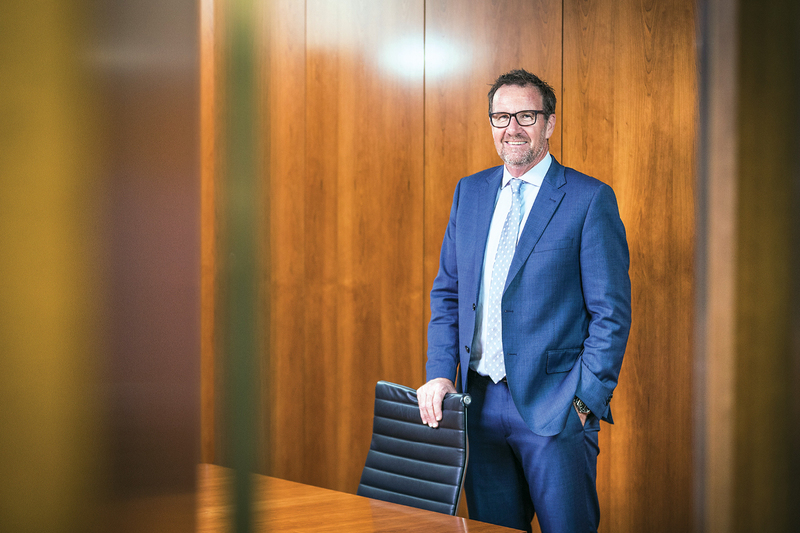 Barfoot & Thompson CEO Chris Dobbie has big plans for the future, but he wants his team along on the journey. The event featured a four-course dinner as well as a 280-metre, 360-degree projection of the company’s history on the walls. Live musicians played, and Barfoot & Thompson capped off the evening with projections of a huge fireworks display. “I can’t imagine what the company’s going to do for its centenary,” says Chris. Back then, Chris was still in the CFO chair at Barfoot &Thompson – a role he held for 17 years. He stepped into the CEO position only earlier this year. But he’s seen 24 years of the company’s history unfold since joining the business in 1994 as an assistant accountant. Despite his many years with the company, his recent step up to CEO introduced Chris to a whole new world of executive duties. “The biggest challenge of my career would have been putting my name in for CEO and having the confidence in my ability to do the job,” he says. “That’s because I’d been doing the CFO role for so long. On his journey from assistant accountant to CEO, Chris has watched tremendous development within Barfoot & Thompson. When he started, the real estate company had 32 branches and around 300 salespeople; since then, its branches have more than doubled, now boasting 76, and there are an impressive 1,700 salespeople (2,500 staff total) working for the team. Meanwhile, the company’s portfolio has blossomed from 5,500 properties to more than 16,000. Barfoot & Thompson’s property managers have gone from being independent contractors to fully integrated team members, and the company has expanded its investment in commercial sales and property management. It’s also looking after units in bodies corporate, with a view to expand this venture further. It’s therefore no surprise that Barfoot & Thompson now holds 40% of the market share. Chris now must ideate the kind of changes he witnessed during his time in the financial division. And though the change in responsibilities has been considerable, it was nevertheless a natural transition for him. For now, focusing the company’s strategic plan is the task at hand. So, what does that pathway ahead look like for Barfoot & Thompson? For one, it’s heading towards investment in new digital technologies. In partnership with DIAKRIT, a software company servicing the real estate industry, Barfoot & Thompson is adding the capacity to offer 3D, interactive digital floor plans of available homes. Potential buyers will be able to use virtual reality not only to inspect homes, but also to virtually arrange furniture and renovate. This experience goes well beyond the typical inspection process – evidence of Barfoot & Thompson’s keen awareness of the industry’s evolution. But for all this emphasis on digital technology, Chris is confident that the personal element of the buying process is still a powerful advantage for Barfoot & Thompson. Some recent start-ups have sprung up in the online real estate business – for example, local Arizto and British-based Purplebricks are both making their mark in New Zealand. Such companies offer lower fees for home purchases and sales but provide slightly less personal services than companies such as Barfoot & Thompson. 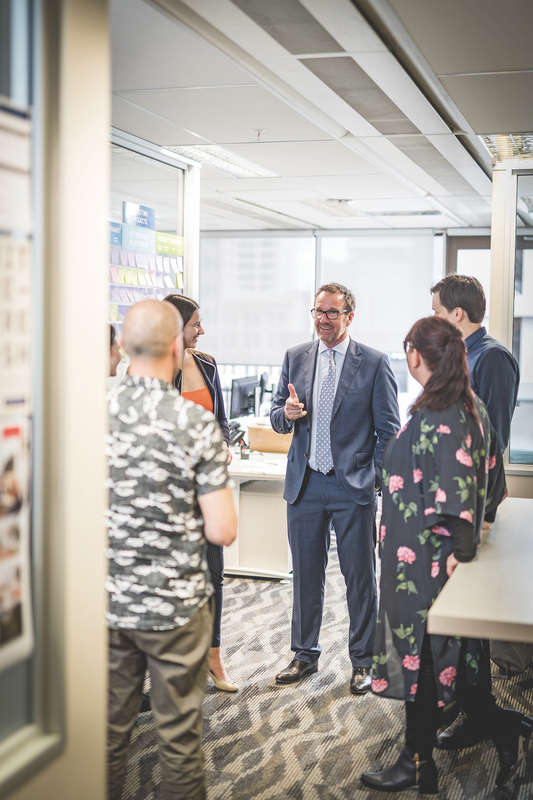 This support of the Barfoot & Thompson team takes precedence over all other strategic business decisions; even investment in new technology is secondary to the company’s focus on its people. Chris spends a good deal of time thinking about the future of the company and its strategic direction. “Barfoot & Thompson has been around for 95 years,” Chris says. “We’ve done very well to get to this point, but to go from being good to being great, we need to have a clear direction. We need to have clarity about what we want to achieve. Barfoot & Thompson must therefore make sure it selects only the best employees for its team – those who perfectly fit into the company’s culture. According to Chris, drive and determination are among the necessary qualities, but he also stresses the need to acknowledge problem team members Although it’s a last resort, the company has had to part ways with some salespeople who have acted in conflict with the Barfoot & Thompson culture. Chris compares the company’s approach to employment to welcoming someone into one’s family. This seems only appropriate, given that Barfoot & Thompson remains a family business, with members of both the Barfoot and Thompson families serving as company directors. It’s a crucial aspect of the company’s selection process; both a manager and a Barfoot or Thompson family member interview every prospective salesperson before they can join the company. In addition to ensuring that new arrivals are well-suited to the team and warmly welcomed at the start, Barfoot & Thompson also provides ongoing support in their roles. The company’s in-house training program and training team provide staff members of all levels with free and comprehensive real estate training. The program capitalises on decades of industry experience, both from within and outside Barfoot & Thompson. It includes intensive induction training and provides long-term workers with assistance in their continuing career progression. Property managers must also undergo regular advanced-skills workshops to stay up to date with changes around law, technology, and operational methods.As well as this general level of employee support, Barfoot & Thompson offers training to make sure the team conforms to the compulsory Real Estate Authority (REA) requirements. The REA is the governmental regulatory body for New Zealand’s real estate industry, and it defines a Code of Professional Conduct and Client Care. The code outlines the high standards agents and property managers must meet, and Barfoot & Thompson is committed to ensuring its team achieves these standards. It’s a form of mutual support – if management encourages employees to perform at their best, then those employees, in turn, enable Barfoot & Thompson to excel within the industry. The company also runs several community events to demonstrate the extent to which family values are inherent in Barfoot & Thompson. One such event is a trip to the Auckland Zoo for staff and their extended families; the last zoo outing hosted 5,000 people for after-hours festivities of food, drinks and zoo experiences. To get at these ideas, Chris gathers the managers from Barfoot & Thompson’s 76 offices at a neutral location and splits them into groups of 15. Here, they’re encouraged to open up and engage in two-way communication in a space in which they have the freedom to be honest. For Chris, it’s a powerful exercise in working cooperatively and one that prioritises listening over talking – ideals that characterise his tenure as CEO. The previous CEO’s resignation gave Chris the opportunity to re-examine the business and consider how it could change. He decided that it should be managed more consultatively, and this decision is partially what encouraged him to put himself forward for the role. Fortunately, the company’s directors have allowed Chris to operate as he’s seen fit. He describes his approach to leadership as providing the team with ‘an open book’ – letting them convey how they’d want to do things. “To me, the most important thing, if you’re going to move forward, is taking the team with you,” Chris explains. “I needed to know where we were and where we wanted to go. The management team had some watershed meetings, but I also asked them to nominate salespeople that could come to sessions. I listened to the sales teams, property-management teams and administration teams to find out how they thought we could move forward. Val Barfoot founded V Barfoot Land Agent in 1923. After his brother joined him a year later, the company became Barfoot Bros. Six years after Maurice Thompson came into the fold in 1934, the company changed its name to Barfoot & Thompson. Today, it remains a family business; Maurice’s grandson, Peter Thompson, serves as Managing Director, and Val’s granddaughter, Kiri Barfoot, is a Director. This communication strategy is equally essential to the success of Barfoot & Thompson’s supplier relationships. Chris is proud of these partnerships, some of which go back more than 25 years. He stresses that the company “doesn’t do this all by itself”. 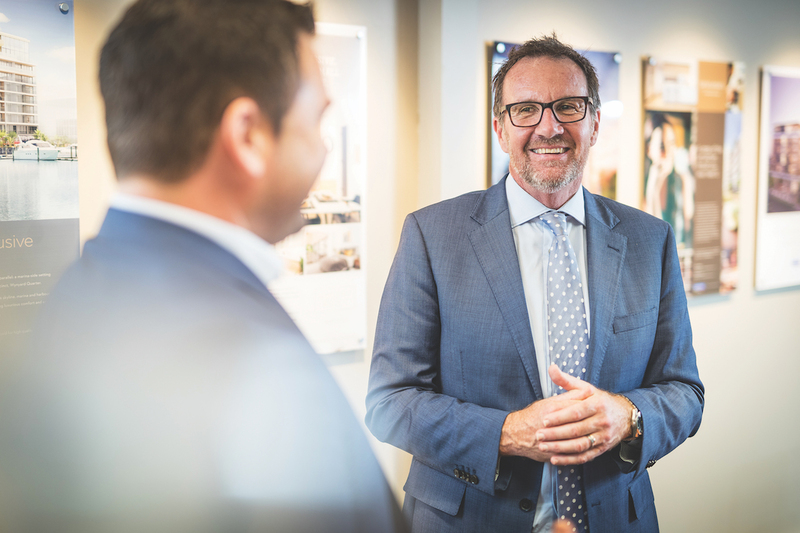 These partners have been part of Barfoot & Thompson’s evolution, and Chris expects their contribution to continue as the company strives for its next level of success. Said international awards are also a source of pride. In 2015, the International Property Awards named Barfoot & Thompson New Zealand’s best real estate agency, best lettings agency and best real estate marketer. The company topped this feat in 2017 when it won world’s best property-management division at the same event. Chris credits this international recognition to Barfoot & Thompson’s partnerships with other real estate agencies across the world. For example, the company is now part of the Leading Real Estate Companies of the World (LeadingRE) network – an exclusive, invitation-only industry group that incorporates only the world’s best residential brokerages. Barfoot & Thompson joined the group roughly four years ago, and Chris believes these connections are invaluable, even though Barfoot & Thompson is strictly New Zealand-based. Similarly, Barfoot & Thompson is part of the New Zealand Realtors Network, which operates across the country. Given that Barfoot & Thompson is based only in Auckland and Northland, the partnership made sense. 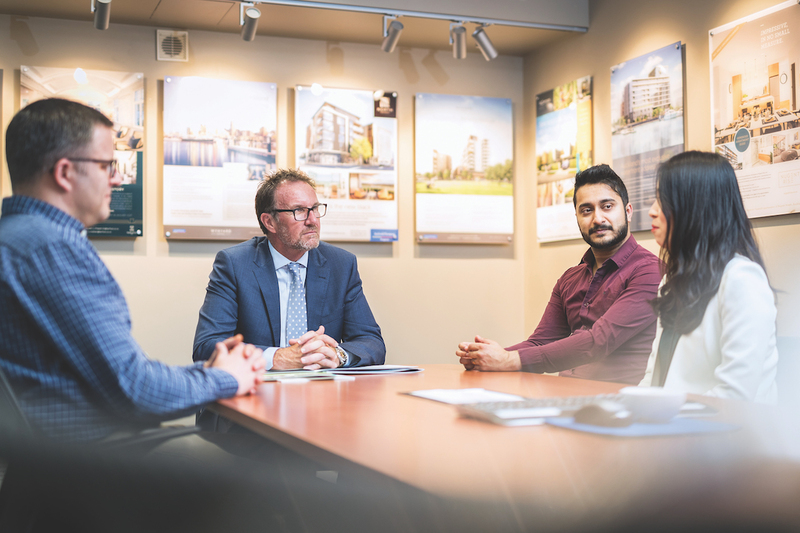 The real estate company hosts regular conferences with others in both LeadingRE and New Zealand Realtors networks, which has been beneficial to Barfoot & Thompson’s business relationships. But it’s not just business partnerships that showcase the company’s zest for cooperation. Barfoot & Thompson is also a champion of its local community, supporting numerous organisations. One of the most notable programs the company backs is the Starship Foundation, a group that raises funds for Starship Children’s Health, New Zealand’s first exclusive hospital for kids. Since 2003, Barfoot & Thompson has donated NZ$2.5 million to support the foundation, which helps the hospital accommodate thousands of patients every year. As part of its efforts for Starship, one initiative Barfoot & Thompson runs is the Young Authors Challenge, which celebrated its 10th year in 2017. The challenge calls for submissions from young authors across Auckland and Northland; last year, children submitted 2,400 stories. The company publishes the winners in a short, illustrated book, proceeds of which go to book donations for Starship. To date, children at Starship Children’s Health and the children’s ward at Whangarei Hospital have benefited from the donation of 166,000 books. Barfoot & Thompson also sponsors several local sports teams and events, including rugby, netball, and the B&T half marathon as part of the ASB Auckland Marathon. Most recently, the company extended its support of the marathon to include the Kids Marathon, rewarding schools that choose to sign up teams of runners. The company also lends its name to the Barfoot & Thompson Auckland Cup, an annual, week-long horseracing event. 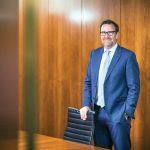 With such a robust network of collaborators, Barfoot & Thompson is in a strong position to weather continual change and development in the real estate sector. In New Zealand, the property market looks set to transform drastically. After nine years of a government led by the conservative National Party, New Zealand elected Jacinda Ardern of the Labour Party, whose platform included housing affordability and limiting foreign property buyers. Though the market has continued to grow, it appears to be moving a little more slowly. In June, the national average house price rose by 6.9%, a slight dip from the 7.3% of the previous month. Nationwide, government support and central bank lending restrictions are fuelling demand. Despite unpredictability, the market is not in dire straits. Some caution exists, but house prices are nevertheless growing, giving Chris good reason to be optimistic about Barfoot & Thompson’s future.